This is the second of the large quilted art pieces made for GAIA in 2008. Initially this commenced as a portait painting on natural homespun which, when complete, was cut out and hand appliqued to a dark background. The dove was also painted then appliqued. The backgound although mainly dark has some simple patchworked sections, like the former one of Persephone. Who is She? Well here is a little mystery. This work which began began as an intriguing, anonymous portrait evolved into a priestess like figure. Is She Mary? Brighid? Stella Maris? 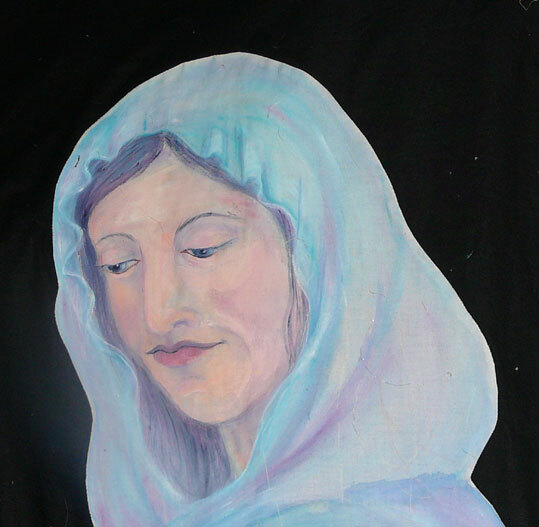 Saint Brigid? Hestia? a Vestal Virgin? or? ?? for they are all linked through shared symbols that go back to a very Ancient Mother. Symbols that have persisted to through the ages and used by many different cultures. Lucus Apellenus, long ago penned a hymn that describes Her as “the natural Mother of all things, Mistress and Governess of all elements”. Her role is both creative and nurturing as She tends the flame. 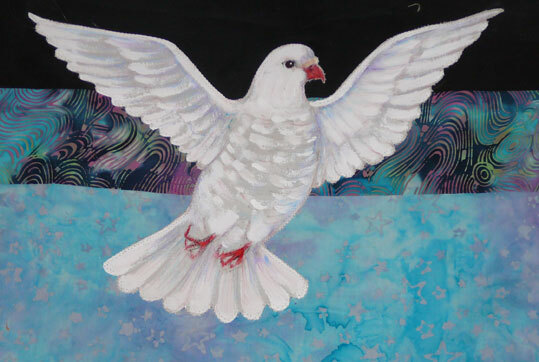 Above Her hovers a dove signifying peace, love and spirit. Around Her is the infinite cosmos reflecting all the mysteries that have perplexed humanity for eons. Silver quilted stars shimmer in the darkness, signifying hope, and connection. She resonates love and peace, compassion and comfort. In Her outstretched hands She offers a bowl of fire. Her eternal flame lighting the darkness, brightly burns to light the way to understanding and awareness of the wisdom that burns within. It burns away fear and ignorance, cleansing and purifying, regenerating and transforming. The flame, too, speaks of hearth and home of sustenance, fertility and family. To me the Lady of the Flame is strongly associated with Brigid whose flame also inspired poets and handcrafts especially metallwork, weaving and needlework. Very much like Athena, in these respects, Brigid also stood for justice. Brigid however was supremely resilient. Whilst many of the other older forms of the Goddess disappeared Brigid remained in the Christian Church transformed into a saint . She shines as an inspiration through the ages to the present day and ,one suspects, will far beyond.